With the March 3rd Canadian RRSP Deadline only weeks away, we are reminded of yet another impending deadline: filing our income taxes. The income tax deadline in Canada this year is Wednesday, April 30th, 2014. As much as we here at Continuum II know about managing money and building wealth, even we know when to call on experienced accountants (which we, admittedly, are not) and tax time is definitely one of those occasions. However, we certainly do know how daunting the income tax preparation process can be each year when it comes to your finances, investments, and all those documents you need to find and organize. Despite the fact that we all complete this process, year after year, somehow each time we are faced with the task again, we find ourselves asking "what do I need?" To print this handy checklist, just click on it once to enlarge, then right click your mouse and select "Print". Take note that you may not receive documents such as your T4 (from your employer) or RRSP Contribution Receipts (from your financial institution) until the end of February (and even later if you make RRSP contributions up to the March 3rd deadline). The important thing is to know what to watch for in the mail, and set it aside with this checklist and the rest of your papers as soon as it arrives. In a sharing mood? Simply click any of the little icons (below, left) to share this template on Pinterest, Facebook, Twitter, or via email to friends & family you know will benefit from a helpful tool at tax time. 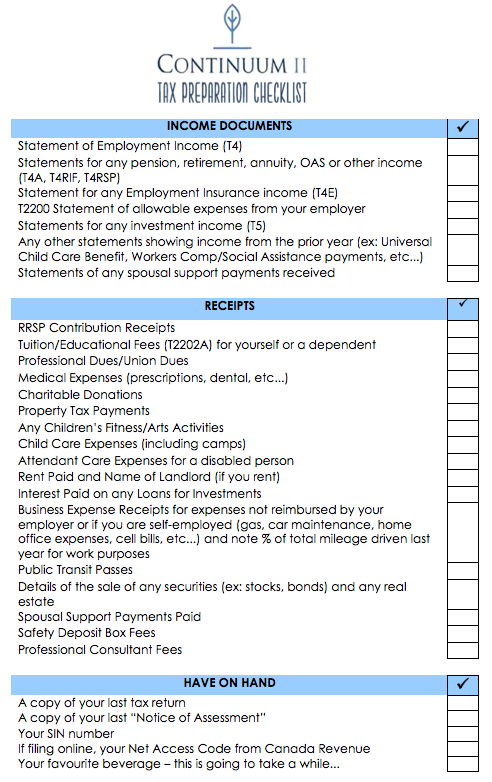 Thank you for sharing this check list with us, online tax preparation has surely made it easier for us to file taxes.